Abul-Fotouh: Can a presidential candidate please everyone? 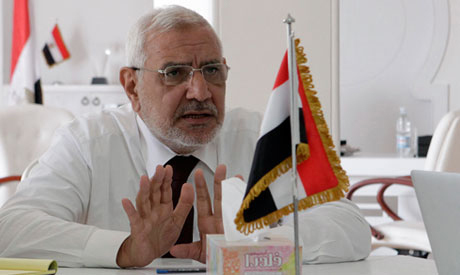 Moderate Islamist Abdel-Moneim Abul-Fotouh, who has been trying to gather support from all sections of Egypt's political landscape around his 'Strong Egypt' project, has run into obstacles of late. After Mohamed ElBaradei's decision not to stand for president, many of his liberal supporters turned to Abul-Fotouh due to his moderate Islamist views and his attempts to create consensus among different political powers. However, liberal doubts about Abul-Fotouh have been growing in recent weeks, especially after the Salafist Nour Party, Al-Jamaa Al-Islamiya's Building and Development Party and the Salafist Calling backed him for president. They were also unhappy about his statements on the implementation of Islamic law and the closure of breweries. Novelist Alaa Al-Aswany reflected the fear of many liberals when he said via Twitter that, "We need to know what Abul-Fotouh has promised the Nour Party to get their support." Liberal activist and Abul-Fotouh supporter Ahmed Badawy told Ahram Online that Abul-Fotouh did not have as many liberal supporters as some have claimed. "His appeal to liberals may be affected negatively by his comments on female genital mutilation (FGM), despite the fact that the comments were edited to give the wrong impression of his words," he added. “He said on the CBC channel that he rejected FGM except for medical reasons. But in a matter of hours his statements were taken out of context and edited in way in a way that made him sound pro-FGM,” Badawy explained. Doubts over Abul-Fotouh are also beginning to emerge from the Salafists over his commitment to the Islamist project. His views on the death penalty for apostasy from Islam, female genital mutilation, censorship, lowering the marriage age, acceptance of a woman or a Christian as president, and on religious conversions, directly contradict those of the ultraconservative Salafists. The Muslim Brotherhood and Salafist groups are using Abul-Fotouh's more moderate views to discredit him in the eyes of conservative voters, said Badawy. The Brotherhood’s official spokesperson, Mahmoud Ghozlan, published an op-ed two weeks ago which listed all Abul-Fotouh's views that contradict those of the Salafists, for example on women's rights and whether a Christian could become president, and how the Salafist Calling stood against the Brotherhood in the 2005 parliamentary elections because of these particular issues. “How can I elect a man who wants to teach Naguib Mahfouz's The Children of Gelebawi [which religious conservatives label 'blasphemous'] in schools?” prominent Salafist Sheikh Mohamed Abdel-Maksoud asked during a rally for Mohammed Morsi, the Brotherhood's presidential candidate. The comment was made because Abul-Fotouh had stated that he opposed censorship of literature. Dissident radical cleric Wagdy Ghonim recently condemned Abul-Fotouh as a "liberal candidate" for his views on apostasy and the 'blasphemy' in Mahfouz's novels. Religious fanatics attempted to murder Mahfouz in 1994 because of supposed blasphemy in The Children of Gelebawi. According to Ibrahim Houdabi, a researcher into Islamist groups, it is difficult to determine the impact of critical statements by Salafist clerics on the voting patterns of religious conservatives. “Questions about Islamic law should be referred to Al-Azhar or Dar Al-Ifta, not the president,” Houdabi said. Despite Abul-Fotouh's contribution to Egypt's revolution, some revolutionaries have become dismayed at his recent comments about the Supreme Council of the Armed Forces (SCAF). In an interview on Al-Nahar two weeks ago, he said, “I will seek the advice [after he is elected] of Field Marshal Tantawi and all the country's honourable citizens.” The statement spread like wildfire across the internet because revolutionaries are adamant that SCAF members be held accountable for numerous attacks on civilians by the military during the transition period. “There is something called video editing,” leftist activist and Abul-Fotouh supporter Wael Khalil told Ahram Online. "Many of his video clips and statements on YouTube have been taken out of context." “Not all of us agree with Abul-Fotouh but we are trying to find common ground among political powers to end this polarisation at such a critical moment of the revolution,” Khalil added. "He is not trying to satisfy all political powers in Egypt but he is trying to find consensus, acceptance and common ground for everybody based on the principle of social justice." In the coming days, Abdel-Moneim Abul-Fotouh will discover if he can unite diverse political factions behind him and his Strong Egypt campaign or if he is the jack of all trades in Egypt's presidential election.